Small - $96.99 Only 2 left! Medium - $96.99 Only 7 left! Large - $96.99 Only 2 left! Squirrel Girl has a pretty impressive resume. Throughout her career as a superhero, she has defeated foes way above her class on a fairly consistent basis. She single-handedly defeated Thanos while Uatu the Watcher watched her. Back in '91, she defeated Doctor Doom with a legion of angry squirrels. Even Wolverine was no match for her! She clobbered him good for not letting her work as a nanny. And then there was her big battle against Fing Fang Foom... which still baffles many of the Avengers to this day. She even defeated Ego, the Living Planet. Heck, it took the entire Guardians of the Galaxy team to do it in the movies! The feisty mutant girl really can do it all, which is probably why she was known as the powerhouse of The Great Lakes Avengers (ever heard of them?)! 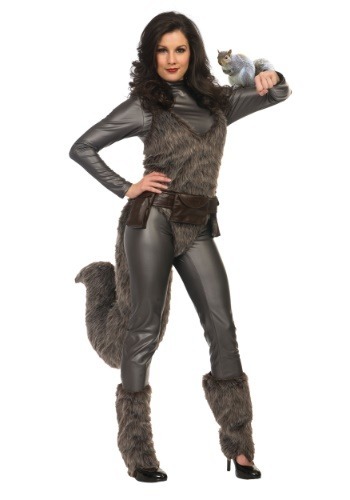 If you're looking to dress up like a hero who can take out any supervillain and come out on top, then you want to be the one and only, Unbeatable Squirrel Girl! This Premium Squirrel Girl costume might not come with an army of real, live squirrels to do your bidding, but it does come with everything else that you'll need to transform into the Marvel superhero. The costume comes with a plush leotard that has plenty of faux fur accents. It also comes with a belt that has an attached faux fur tail. It even comes with a squirrel ear headband to round out the look! Once you have this costume on, you'll feel raring to go against the universe's most deadly villains! Even M.O.D.O.K. will seem insignificant to you! However, we do recommend that you start making friends with the local squirrels now. You never know when you will need an army of them to assist you during your next big battle against the forces of evil.